Email security has evolved beyond the need for simple spam and virus control. Spam is now 75% of all email, and 1 in 200-250 emails are malicious. Email is the #1 largest vulnerability for businesses. Companies need a managed email security solution to shore up this vulnerability with a corporate level solution that combats phishing, malware, spam and is easy to use. Phishing threats are contained in 1 in 300 emails. Threats are contained in obfuscated links and attachments. Criminals leverage phishing attacks to elicit personal private information, and malicious code exploits against new vulnerabilities contained in browsers, applications, plug-ins and operating systems. Lastly, Ransomware which effects companies of all sizes, leverages weak email security as a primary attack vector. Regulation compliance and “best practices” continues to drive increased email security as well. Protecting personal private data is a key requirement. DLP and encryption help protect this information, but companies need to deploy these strong email security solutions. Managed Email security is one of the best ways to get what you organization needs to reduce email threats. company to produce email records from up to 10 years ago. A strong managed email security solution can provide strong security and email archiving with e-discovery. With email the predominant productivity tool but also an enormous threat vehicle, it stands to reason that we must bring to bear the most sophisticated email security available. It may be time to upgrade your current solution to one that protects all areas of vulnerability and provides the security and convenience of a managed emails security solution. eSecurity Solutions provides best-in-class managed email security by leveraging its 13 years of security experience combined with the best-in-class cloud security solutions from the industries leading security vendors. We provide solutions with enterprise level email security features companies of all sizes. Wrap expert eSecurity Solutions Managed Email Security Services around a world class SaaS email security solution, and you have the best possible security with complete peace of mind. 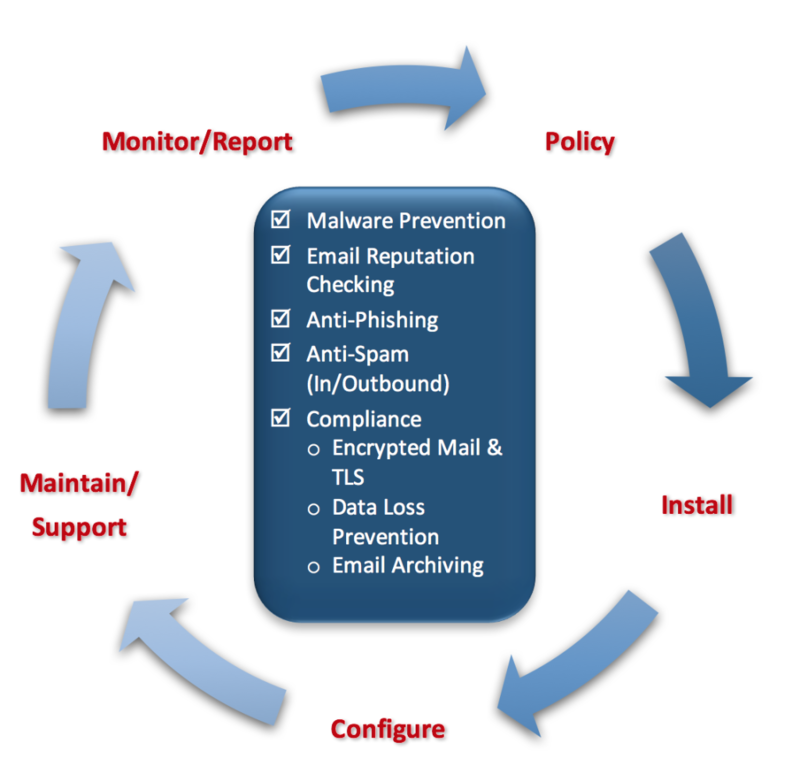 We work with you to define best practice policies, then implement, monitor 24×7 and maintain your email security. We are there for you when you need us with expert advice & services. Need Better Protection from Phishing, Spam & Malware?